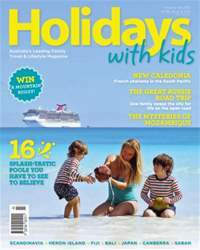 Welcome to the spring edition of Holidays with Kids, full of family-friendly experiences near and afar. For adventures in our own backyard we look to Broome and discover why Australia’s beautiful West Coast is fast becoming a family favourite, before travelling east to Heron Island and the Tweed Coast, stopping at Victoria’s ski fields, our nation’s capital and regional Macarthur on the way. Beyond the seas we explore the colours of Mozambique, test the rides at Universal Studios and Disneyland and discover the many delights of Scandinavia. We also embark on a delicious food tour of Japan before a jungle encounter in Borneo and for island adventure we journey to New Caledonia, Bali and Mark Beretta reviews his holiday to the Fijian island of Yasawa.